History is the best teacher. This is also true of the Swiss financial markets. A look back over the last century allows us to draw six simple conclusions for investors. The nominal illusion is the mother of all mirages. The tricks used to dupe investors include exchange rates, inflation and capital market yields. Those who can see the actual picture will invest with greater success. In nominal terms, one thousand Swiss francs invested in Swiss shares in the year 1900 would today be worth nearly two million francs. This would correspond to an average annual performance of 6.7%. 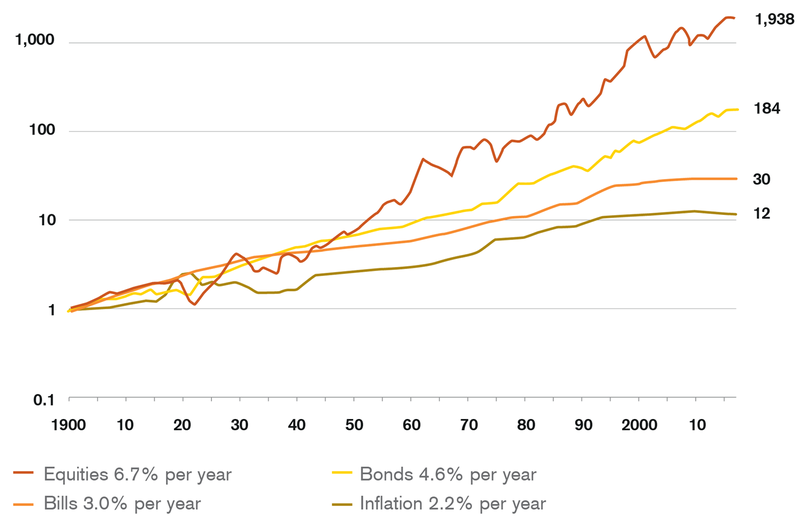 Adjusted for inflation, the real return is still an impressive 4.5% p.a. – higher than the global market. So as not to be comparing apples and oranges, the performance of Swiss shares should be converted into a comparison currency, such as the US dollar. 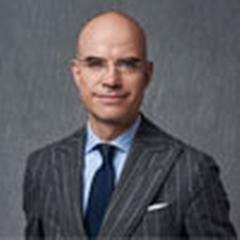 When Swiss investor performance is converted into US dollars (or euros), it highlights the often overlooked bene t of greater purchasing power abroad. If Switzerland did not have its export-oriented pharmaceuticals industry, a huge current account deficit would become visible. This stems from the high amounts of imports and foreign travel that Swiss consumers can afford primarily due to the strong Swiss franc. But let’s return to Swiss equity performance. The conversion to US dollars gives an additional boost to real performance since the franc is the world’s strongest currency today. The franc has appreciated an entire 0.7% p.a. against the US dollar each year. Thus the USD performance of Swiss shares amounts to +7.5% p.a. in nominal terms, and +5.2% p.a. in real terms! This puts Swiss shares into the world’s top five stock markets in history. It also shows that the strength of the Swiss franc is not only a curse, but can also be a blessing – as with most things, it’s all a matter of perspective. Switzerland’s combination of price stability and currency stability creates the best conditions for a successful financial market. Even the volatility of Swiss shares is in the lowest quarter of a global comparison. 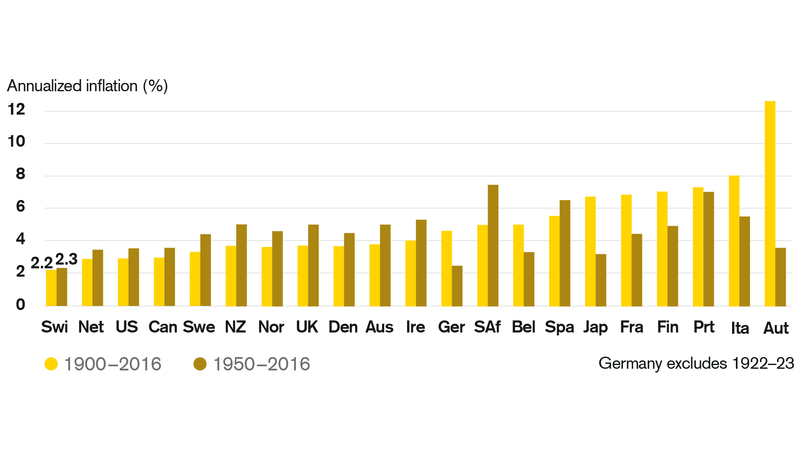 Although Switzerland has just 0.1% of the world’s population (and 1% of global GDP), the Swiss stock market’s share of global stock market capitalization is 3%. Eloquent testimony to a successful model! Even Swiss government bonds turn out to be something of a goodie bag upon closer observation. 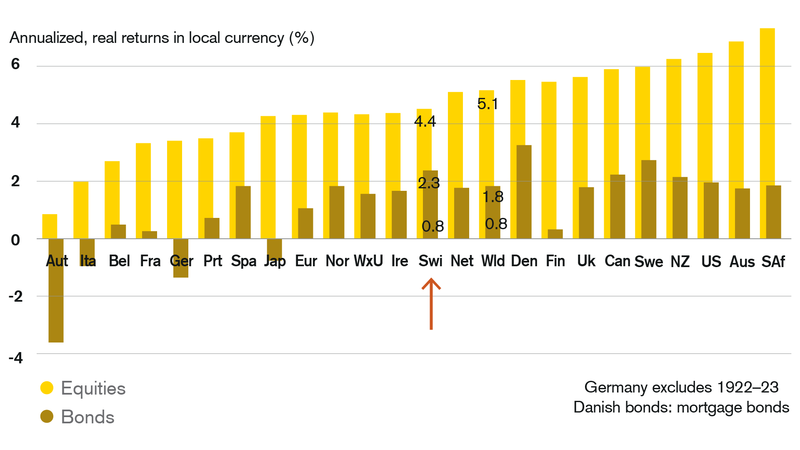 They post the world’s best historical performance, even in local currency (only Denmark appears at first glance to do better, but this is due to a gap in the data that was filled with higher-yielding mortgage bonds). Converted into US dollars, they report a real historical return of +3% p.a. In brief: they win the gold medal for “world’s best government bond”. 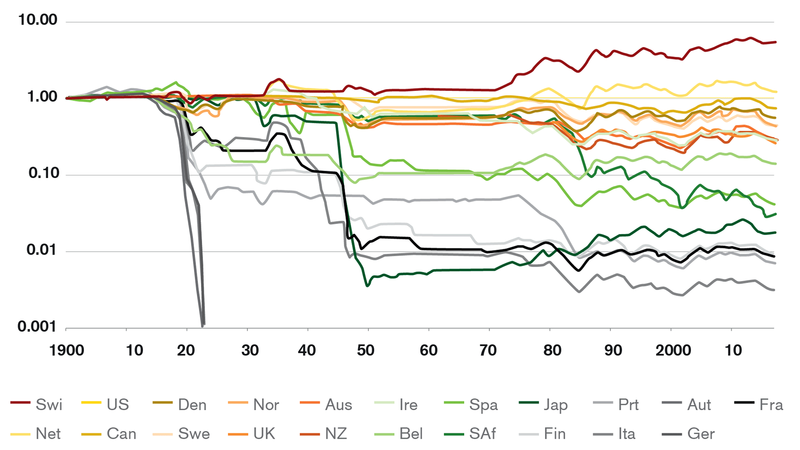 Yield hunters be warned: high returns on weak currencies often turn out to be Fata Morganas. If we depict the annual performance of Swiss shares in a frequency distribution, we see the standard slightly right-skewed normal distribution. This confirms that a) shares offer a long-term positive risk premium and b) their volatility risk decreases as the investment horizon increases. 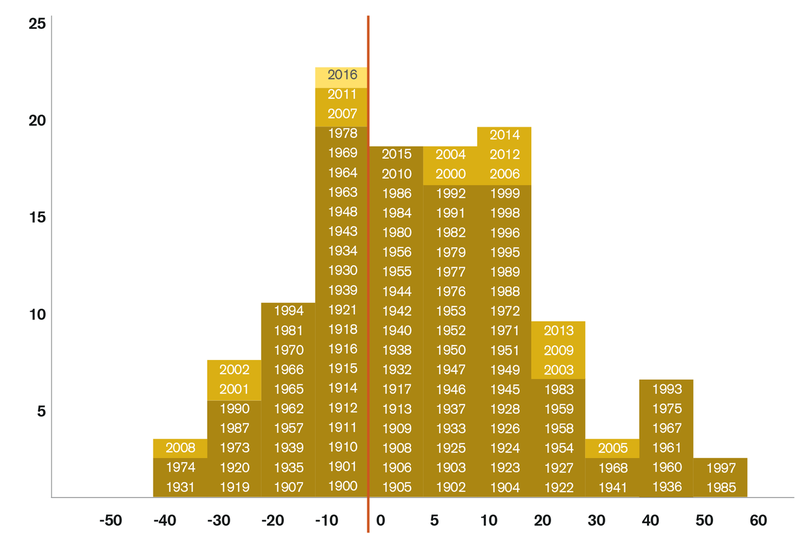 By the way, the longest negative performance interval for Swiss equities was from 1907 to 1931.